Lamb neck is underrated and inexpensive, yet it can be used to create wonderful dishes that are just packed full of flavour. Ask your butcher to cut the scrag into slices 2.5cm thick. Any really fatty bits can be trimmed away but a certain amount of fat is crucial to the dish. Heat the oil in a heavy based saucepan or deep sided frying pan. Add the lamb and allow it to sizzle and spit for a few minutes, turning it until it is lightly browned all over. Add the lemon juice, thyme, water or stock and some salt and pepper to the pan, then turn down the heat, bring the mixture to a gentle simmer. Leave to simmer, with the lid on, for 45-50 minutes, until the meat is tender. 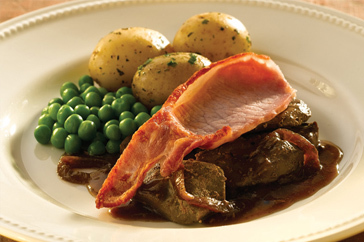 Traditional liver and bacon is a great British favourite, iron-rich it is the perfect hearty autumn supper. It is packed full of flavour and bursting with vitamins and minerals making it the perfect choice for the health conscious among us. Sweat the onion gently in a little oil until it is translucent and tender, then turn up the heat a little so that it browns slightly – be careful not to burn it. At the same time, start frying your bacon in a separate pan. When it is done how you like it, transfer it from the pan to a warmed plate in the oven. Fry the liver in the bacon fat for 3-4 minutes (or more if you don’t like it pink). turning once. Serve the liver on the warmed plate with a spoonful of fried onions, the bacon, a good dollop of mash and some mustard. This is a wonderful dish that uses leftover chicken and turns it into a wonderfully tasty pasta dish. Let it bubble until the cream has reduced a little and the sauce has a nice coating consistency. 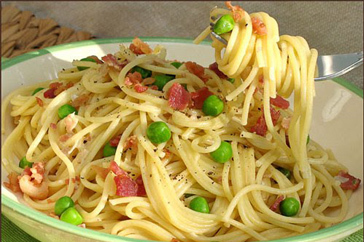 Serve with pasta and parmesan cheese. This is one of those dishes that is quick to prepare which tastes great, making it perfect for a week night when the last thing you want to do is be stuck next to the cooker as everyone else is lounging around on the sofas. Heat a small amount of oil in a large high-sided frying pan, add the Cumberland Sausages and fry for 5 minutes until golden on the outside. Nestle in the onion wedges and continue to fry for another 5 minutes until the onions are browned a little but not black or charred. Then add the apple wedges letting them brown just a little on each side for a few minutes. Stir the redcurrant jelly and mustard into the hot stock and pour into the pan. Let it simmer strongly before turning the head down to a low simmer. 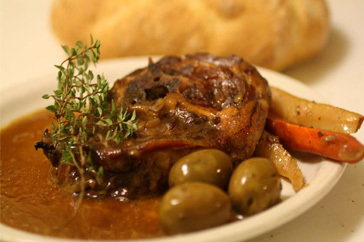 During the cooking process the stock will reduce by about half making rich syrupy gravy. 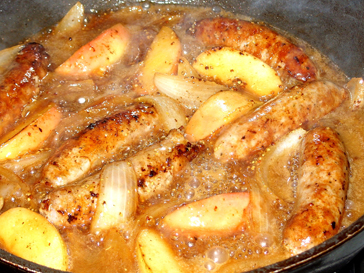 Once the stock has been added you will need to cook the dish for around 10 minutes to make sure the sausages are cooked thoroughly. Serve with Spring Greens on top of a pile of soft, creamy mashed potato.